Robin Youngs, Edward Fisher,	The Journal of Laryngology & Otology, Volume 129 Issue 7, p 621. N C Seymour,	The Journal of Laryngology & Otology, Volume 129 Issue 7, pp 622-626. E Young, A Mitchell-Innes, M Jindal,	The Journal of Laryngology & Otology, Volume 129 Issue 7, pp 627-633. Anatomical variations of the temporal bone on high-resolution computed tomography imaging: how common are they? V Visvanathan, M S C Morrissey,	The Journal of Laryngology & Otology, Volume 129 Issue 7, pp 634-637. M Pezzoli, A Ugolini, E Rota, L Ferrero, C Milani, L Pezzoli, G Pecorari, F Mongini,	The Journal of Laryngology & Otology, Volume 129 Issue 7, pp 638-643. L Lundman, H Edvardsson, K Ängeby,	The Journal of Laryngology & Otology, Volume 129 Issue 7, pp 644-655. R Haye, L K Døsen, O Shiryaeva, E Amlie,	The Journal of Laryngology & Otology, Volume 129 Issue 7, pp 656-661. 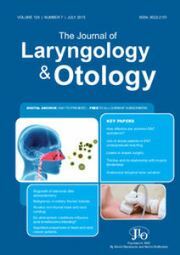 L Wei, M Wang, N Hua, K Tong, L Zhai, Z Wang,	The Journal of Laryngology & Otology, Volume 129 Issue 7, pp 662-665. E Löfgren, S Alikoski, S Hannula, M Sorri, O-P Alho,	The Journal of Laryngology & Otology, Volume 129 Issue 7, pp 666-669. M S Atfeh, H S Khalil,	The Journal of Laryngology & Otology, Volume 129 Issue 7, pp 670-676. S M Keh, S K El-Shunnar, T Palmer, S F Ahsan,	The Journal of Laryngology & Otology, Volume 129 Issue 7, pp 677-681. P V Kaye, M Pigera, M M Khan, P Hollows, N Beasley,	The Journal of Laryngology & Otology, Volume 129 Issue 7, pp 682-687. M V Akdogan, H Erinanc, O Topal, S S Erbek,	The Journal of Laryngology & Otology, Volume 129 Issue 7, pp 688-692. M Mat Baki, R Yu, J S Rubin, E Chevretton, G Sandhu, M A Birchall,	The Journal of Laryngology & Otology, Volume 129 Issue 7, pp 693-701. (Ton)silly seasons? Do atmospheric conditions actually affect post-tonsillectomy secondary haemorrhage rates? B Cadd, M Rogers, H Patel, G Crossland,	The Journal of Laryngology & Otology, Volume 129 Issue 7, pp 702-705. B Cosway, M Easby, S Covington, I Bowe, V Paleri,	The Journal of Laryngology & Otology, Volume 129 Issue 7, pp 706-709. R Madan, A K Kairo, A Sharma, S Roy, S Singh, L Singh, J Kaur, B K Mohanti, S Bhasker, A D Upadhyay, G K Rath,	The Journal of Laryngology & Otology, Volume 129 Issue 7, pp 710-714. L Wang, L Li, W Lou,	The Journal of Laryngology & Otology, Volume 129 Issue 7, pp 715-717. J Lee, S Ojha, J Hughes, J Weir,	The Journal of Laryngology & Otology, Volume 129 Issue 7, pp 718-720. M Van, R Gohil, Q Gardiner,	The Journal of Laryngology & Otology, Volume 129 Issue 7, pp 721-724. J G Barr, H Dean, G Morrison,	The Journal of Laryngology & Otology, Volume 129 Issue 7, pp 725-726. JA De Ru, W C Heerens,	The Journal of Laryngology & Otology, Volume 129 Issue 7, p 727.